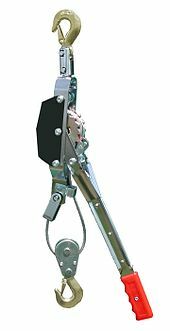 Come-alongs are not rated for overhead lifting, but a similar looking device called a ratchet lever hoist is used this way. The original tool of this type was developed by Abraham Maasdam of Deep Creek, Colorado about 1919, and later commercialized by his son, Felber Maasdam, about 1946. It has been copied by many manufacturers in recent decades. A similar heavy duty unit with a combination chain and cable became available in 1935 that was used by railroads, but lacked the success of the cable-only type units. A similar tool to a come-along is a cable puller which does not have a drum and ratchet but directly grips the cable allowing unlimited lengths of wire rope to be used. This page was last edited on 22 March 2018, at 04:01 (UTC).